The Sheriff's Explosive Ordnance Disposal (EOD) Team currently consists of one Lieutenant, one Sergeant, one Deputy IV, and one K-9. Existing vacancies due to promotions and retirements are in the process of being filled. With the use of continuous and realistic training, state-of-the-art equipment, and most importantly, committed personnel, this team is dedicated to providing professional explosive disposal and render-safe services to the citizens of Fresno County and surrounding counties upon request. In 1971, a large explosive device was detonated in the Fresno County Courthouse during normal business hours. 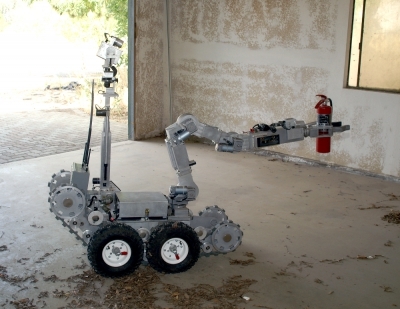 A subsequent explosive event at the Fresno City Hall marked the emerging need for trained investigators as well as trained explosive technicians to handle such incidents. A post-blast investigation training class was brought to Fresno by members of ATF, military personnel from Fresno’s 144th Air National Guard Wing, and the 49th Ordnance Detachment from Fort Ord, California. Approximately 20 students attended that initial training including members of the Sheriff's Office. In 1975, the Sheriff’s Office began sending EOD personnel to the FBI/U.S. 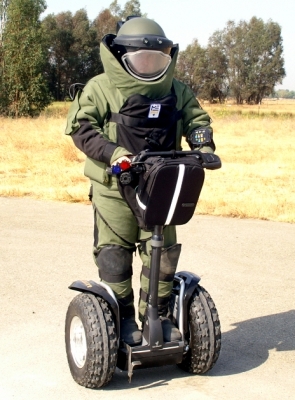 Army training at Redstone Arsenal in Huntsville, Alabama, to be trained as Hazardous Device Explosive Technicians. 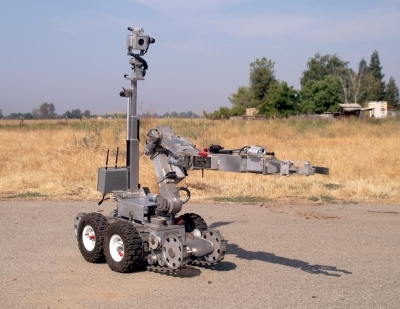 In the 1980s, the EOD team began the challenging effort to procure necessary equipment including a response vehicle, a Hurd’s custom made bomb trailer, Golden x-ray capabilities, and a bomb suit. In those days, a modified and cutdown 12-gauge shotgun served as a remote bomb disruptive tool. Many, many pipe bombs and other devices succumbed to this crudely crafted disrupter, but it worked time and time again. It is now a Sheriff’s Office museum piece as more sophisticated equipment has taken its place. Also during this time, an ATF approved explosive storage facility was obtained near the foothill community of Auberry. 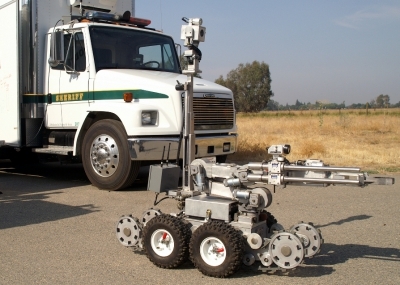 In 1992, the Sheriff's EOD Team was disbanded with the exception of one technician who acted as the Sheriff’s Office liaison to the Fresno Police Department’s bomb squad, who took over all explosive responsibilities within Fresno County, including control and utilzation of the explosive storage facility near Auberry. In late December of 1999, just days before the January 1st, 2000 Millennium celebrations, the Auberry storage site was burglarized with a large amount of high explosives and blasting detonators being stolen. The theft made national news with concerns that the explosives may have been liberated by those bent on anarchy during the upcoming national events. Within days of the burglary, the Fresno Sheriff's Office EOD Team was reactivated with former members being pressed back into service. Also, upon the discovery of the burglary, the Sheriff’s Office immediately formed a Special Investigative Detail to work around the clock in an attempt to determine who was responsible for the theft, and what their intentions were for their newly procured explosive materials. The Sheriff's Office investigation was assisted by Federal, State and other local law enforcement agencies from throughout the country. Within days, four young Auberry area suspects had been identified and arrested. What was believed to be all of the stolen explosives were recovered in nearby Madera County hidden under the floor of an abandoned mountain cabin. Subsequently, the suspects plead guilty to criminal charges and were sentenced to local jail time, absent one suspect who had been killed in a vehicle accident while awaiting trial. With this infamous event concluded, the Sheriff’s Office EOD Team has continued to forge ahead providing its dedicated services to the County of Fresno. Obtaining asset forfeiture and various grant funding including Homeland Security grant funds, a new Freightliner response vehicle was acquired, along with new digital x-ray equipment, two Remotec robots and a large variety of other explosive device intervention equipment. 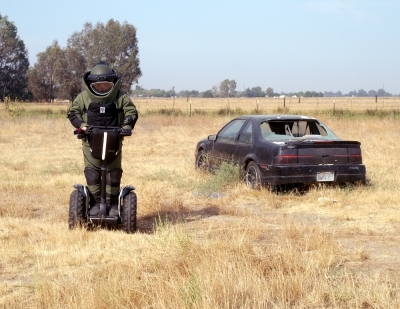 The Sheriff's Office EOD Team has partnered with the Clovis Police Department Bomb Squad to expand services and maintain a full force ready to respond to large and mulitple events within the region. Now, 13 years since its reactivation on January 3, 2000, the Sheriff’s EOD Team has handled in excess of 500 explosive-related incidents. The EOD Memorial Foundation is a nonprofit organization dedicated to honoring the legacy of our fallen EOD Warriors.